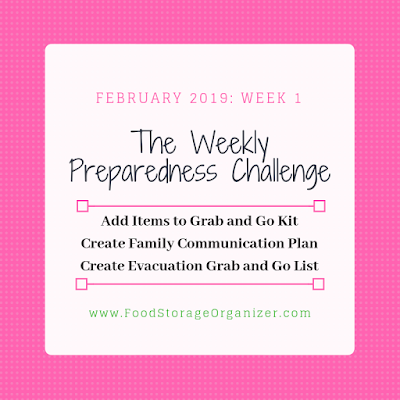 February is here and it's time to work on another Preparedness Challenge. 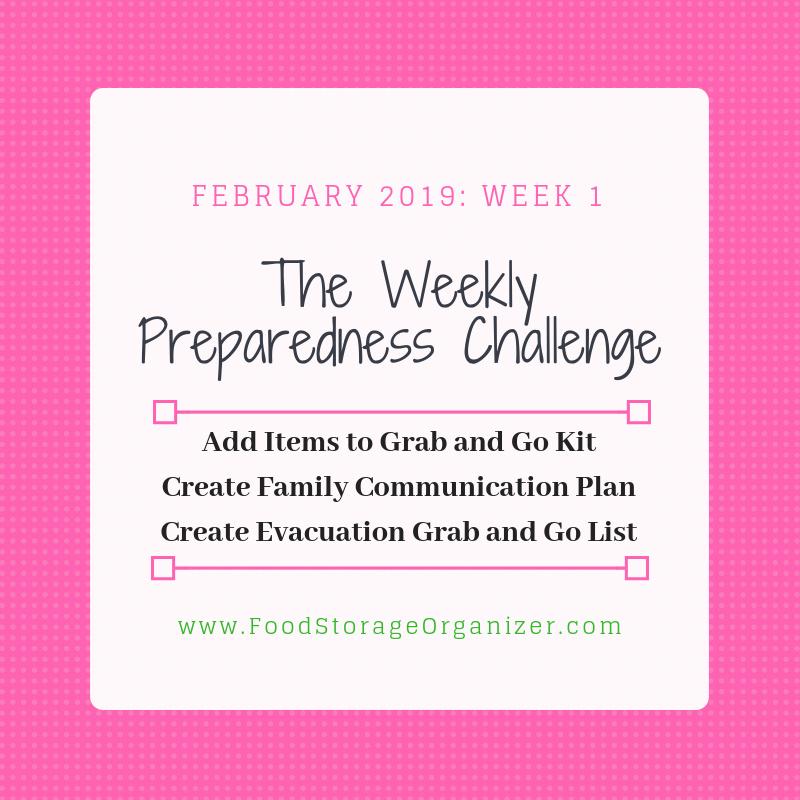 This week we'll add some more items to our grab and go (aka 72-hour) kit, create a family communication plan and an evacuation grab and go list. 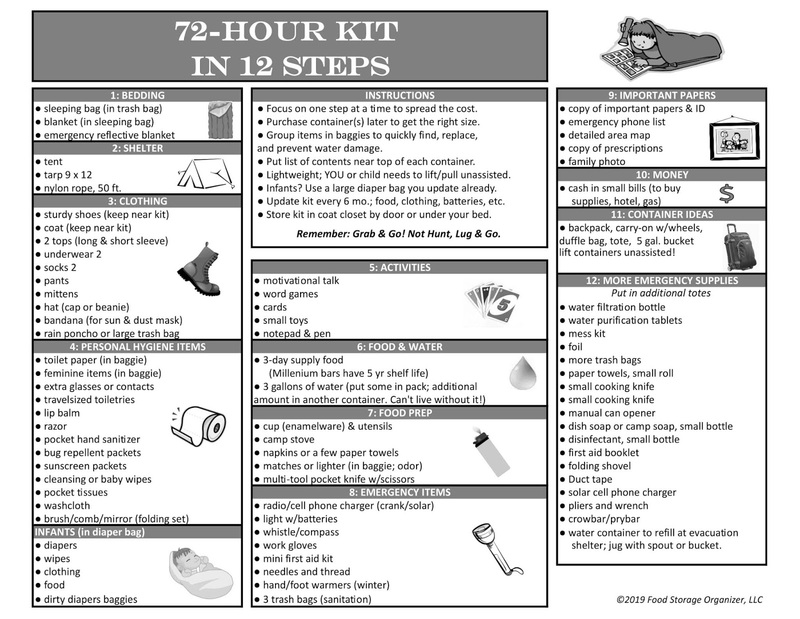 Many of you want to put your kits together quickly, so I included my 72-hour Kit in 12 Steps handout. Let's talk for a minute about 72-hour kits and their purpose. These kits will be what you grab if you need to evacuate your home or workplace. You may need to use some food or water along the way to a shelter or your neighbor's house that didn't get as damaged as your own. 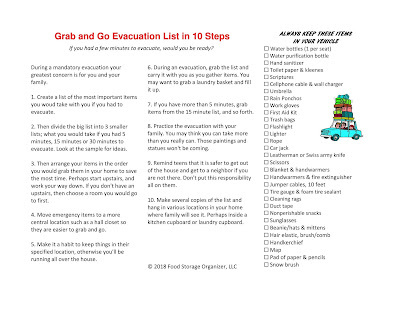 Plan to go on foot in an evacuation. Most people think they'll be able to use their car which would be amazing!!! But sometimes cars don't work, or you can't get it out of the garage. Think of the worst-case scenario; you have a broken leg and are lugging your kit on "the perilous journey through blistering cold and scorching desert, traveling for many days and nights, risking life and limb to reach" the emergency shelter. Mmm. Yes, think about it. If you can't carry your kit, get one with wheels like mine. It's a carryon bag. If your kids can't carry their bag, then get them one with wheels. You can't carry kids, your kit and their kit. I'd invest in a wagon. Or use your stroller. See? Think of the worst but hope for the best. PS You don't have to get a bag for everyone this month. But keep it on your radar. NOTE: Some of the suggested supplies will fit in a backpack, but plan on an additional tote as well. put what you need least in the tote and more important items in your kit. Family Communication Plan. DO NOT rely on your cell phone working. More below. Family Photo. For identification purpose or memories. Or use those school picture ID cards your kids get when they get knew pictures. Small Notebook and Pen. You'll want to journal your adventure or may need to leave a note somewhere. Permanent Marker. You may need to write a phone number on your child's arm in case you get separated. AM/FM radio, solar or crank. You need to hear emergency news. Don't count on your cell phone. City Map. Yep, don't count on your cell phone GPS. Copy one online. You need to know roads you can exit your area. There may be roads you don't normally use. Travel-Sized Toiletries, Body and Teeth. You want to smell good, right? Put in a baggie with the date you packed it. Three water bottles in a large baggie if you didn't to that last month. Put the date you packed it on it. Laminate it or put it in a plastic bag to prevent it from getting wet or snowed upon. 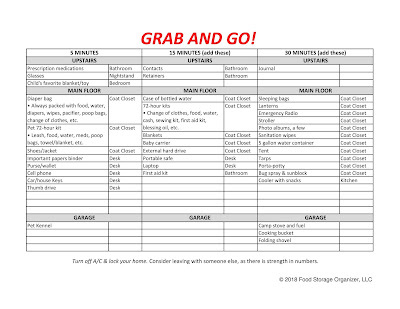 Print and fill out the Grab and Go List. 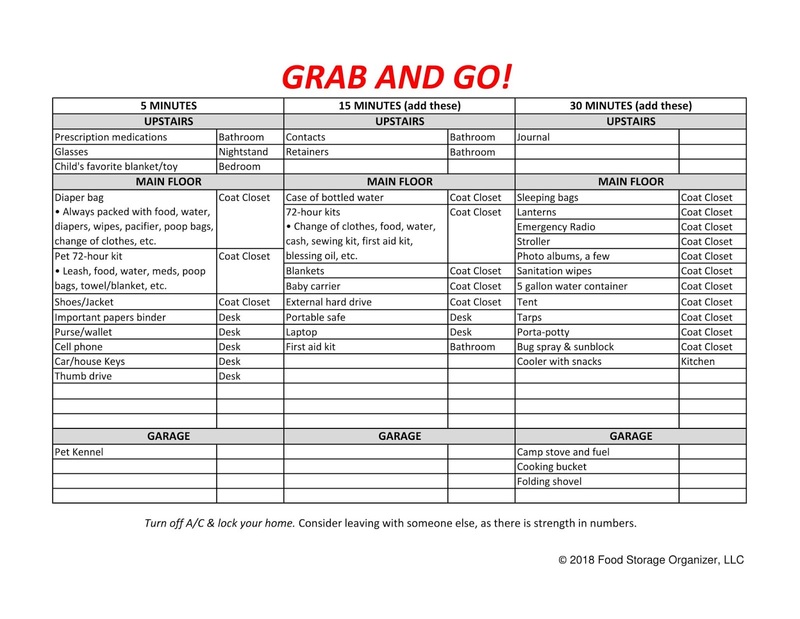 Prioritize what you would grab, and where it is in your home while you are calm and collected. You want to work on this list BEFORE you have an adrenaline rush and can't remember the name of your gas company! (That was me. :) The handout is for a 5 min., 15 min. and 30 min. evacuation. 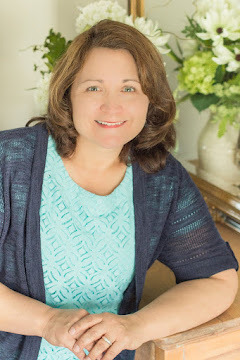 You'll prioritize and put the most important items in the 5 min. evacuation and so on. Hang a few copies around the house inside cupboard doors. I promise you won't self-destruct if you don't get these tasks completed in the next seven days. You may need the whole month to get them completed. That's A-OK. Do the best you can with the time you have.